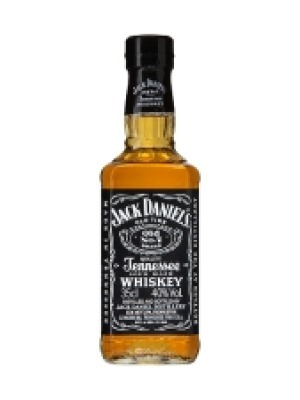 Jack Daniels Old No 7 Tennessee Whiskey is a popular Whisky available from DrinkSupermarket.com in 35cl to buy online. Visit DrinkSupermarket.com for the best price for 35cl of Jack Daniels Old No 7 Tennessee Whiskey or compare prices on our other Whisky products. Since 1866 Lynchburg has been the home to one of the most famous whiskeys in the world : Jack Daniels. So many awards have been won as a result of maple charcoal mellowing process that it would be impossible to list them all here. Suffice it to say that its delicious flavour ensures that it maintains it's position as one of the most popular whiskeys in the world. You can buy Jack Daniels Old No 7 Tennessee Whiskey online in most retailers and find it in the Whisky aisle in supermarkets but we found the best deals online for Jack Daniels Old No 7 Tennessee Whiskey in DrinkSupermarket.com, Tesco Groceries, and others. Compare the current price of Jack Daniels Old No 7 Tennessee Whiskey in 35cl size in the table of offers below. Simply click on the button to order Jack Daniels Old No 7 Tennessee Whiskey online now.